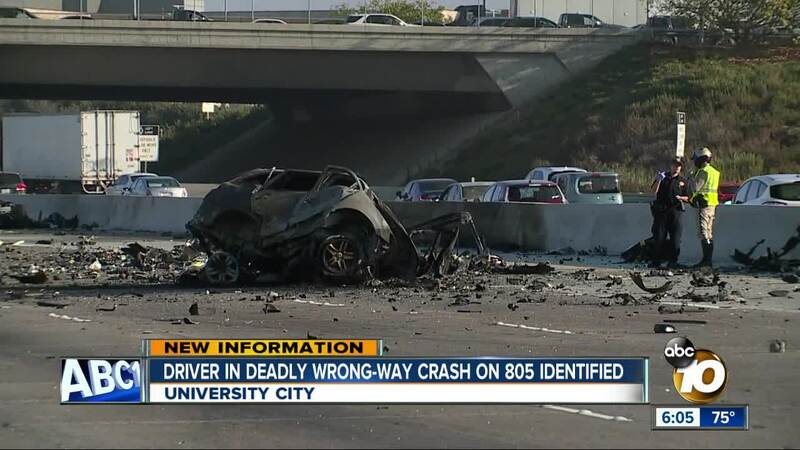 SAN DIEGO — The driver of the McLaren sports car involved in a fiery fatal crash on Interstate 805 Thursday has been identified. Trevor Heitmann, 18, was behind the wheel of the 2014 sports car that collided with an SUV, killing himself, and a 43-year-old woman and her 12-year-old daughter, according to the San Diego Medical Examiner. The mother and daughter have yet to be identified. The medical examiner is using an alternative means to identify the bodies because of how badly they were burned, according to the California Highway Patrol. Heitmann was traveling at a high rate of speed heading southbound in a northbound HOV lane at about 4:30 p.m. near La Jolla Village Dr. before the collision, CHP said. Troopers believe he entered via an HOV lane access at Carol Canyon Rd. The two vehicles collided and exploded into flames, witnesses said, causing a chain reaction of crashes with at least five other vehicles. Heitmann was killed of blunt force trauma and pronounced dead at the scene, the medical examiner reported. The two occupants of the SUV died due to the fire which engulfed the vehicle after the crash, the report said. It's still not clear why Heitmann was traveling at such a high rate of speed in the wrong direction. According to the California Department of Motor Vehicles, his driving record was clear. CHP said Heitmann's vehicle was linked to an incident at Ashley Falls Elementary School in Carmel Valley before the crash, in which several students said the driver of a sports car drove through a fence. Del Mar Union School District said the driver got out of the car and broke a window, though no classes were in session. Heitmann is allegedly a popular YouTube personality who goes by the name of "McSkillet," according to numerous gaming website reports . McSkillet's YouTube page lists numerous videos surrounding the video game Counter-Strike: Global Offensive including "skins" or weapon customizations and tips on earning sponsors. One of the videos on McSkillet's page shows off a black McLaren and talks about how his earnings as a YouTube and Counter-Strike "Steam" content producer helped pay for the luxury sports car. All lanes on northbound I- 805 at La Jolla Village Drive were shut down for about 10 hours due to the investigation and clean-up effort.